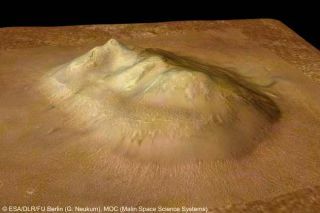 The feature known as the Face, along another skull-like feature and pyramid-looking hills in the vicinity, are in an area called Cydonia in the Arabia Terra region. It is a transition zone between the southern highlands and the northern plains, and it contains wide valleys and ancient remnant mounds, called massifs, of many shapes and sizes. A strong myth developed, holding that the Face was an artificial structure built by some ancient civilization. Surrounding pyramids-also just interesting-looking massifs-fueled the myth. Last year, a study helped explain why: People see faces that aren't there-on Mars or in clouds-because we have "over-learned" to recognize the human face.